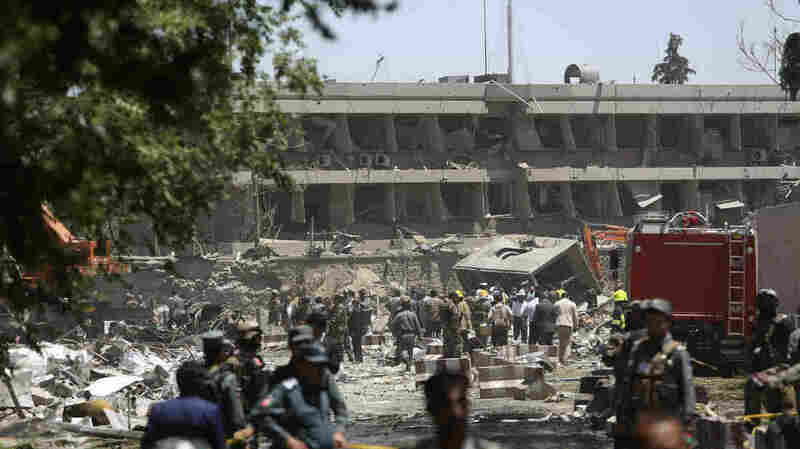 Kabul Truck Bomb Kills At Least 80 People, Injures Hundreds More : The Two-Way At least 13 officers of the Afghan National Police were reportedly killed, and 11 U.S. contractors are among the wounded, after a massive explosion near foreign embassies. Security forces inspect the site of a massive explosion in a busy area not far from the German Embassy in Kabul, Afghanistan, on Wednesday. A huge truck bomb explosion early Wednesday killed at least 80 people and wounded more than 400 others in Kabul's diplomatic zone, Afghanistan's Ministry of Public Health says. The attack struck the busy neighborhood in the capital city just before 8:30 a.m. local time, during Kabul's morning commute. The explosion destroyed or damaged more than 50 vehicles, the Ministry of Interior Affairs said. The bomb was detonated near Zanbaq Square outside the "Green Zone," according to the NATO-led Resolute Support mission, which adds that Afghan security forces kept the car bomb from entering the Green Zone, "but the explosion caused civilian casualties in the vicinity." At least 13 officers of the Afghan National Police were killed, says Resolute Support, which added, "May these heroes rest in peace." The U.S. State Department tells NPR's Michele Kelemen that 11 U.S. contractors are among the wounded, and that the injuries are not considered life-threatening. A driver for the BBC and a technology worker with TOLO TV were killed and other people who work in the media were wounded, the Pajhwok Afghan News network says. The blast targeted a neighborhood that is home to several embassies and is not far from the presidential palace. So far, no group has claimed responsibility for the bombing. Taliban spokesman Zabiullah Mujahid told NPR that "his outfit has nothing to do with this blast and that they have not carried out the attack," Abdul Sattar reports for NPR. "The [truck] bomb exploded at the height of the morning rush hour on one of Kabul's main streets, not far from the German Embassy, at the entrance to the offices of a major Afghan cellphone company and popular TV station. "It's not clear what the target was, but as is often the case, many civilians were injured by the blast. "A mile away there was first a low rumble like an earthquake, then the shock wave from the blast followed and blew open doors and windows. Closer to the explosion it shattered glass in homes, offices and cars. "Both the Taliban and Islamic State have stepped up attacks on Kabul and elsewhere in Afghanistan." An Afghan security officer who had been protecting the German Embassy died in the attack, and while members of the embassy's staff were injured, "All are now safe," says German Foreign Minister Sigmar Gabriel. The blast blew in the doors and windows of the embassy building, Esme Nicholson reports for NPR from Berlin. She adds that for now, Germany will suspend deportations of rejected Afghan asylum seekers, to ease the workload of the embassy staff in Kabul. Afghan President Ashraf Ghani issued a statement saying he "strongly condemns the cowardly attack in the holy month of Ramadan targeting innocent civilians in their daily life." The president visited victims of the attack who were being treated in a hospital today; later tonight, he'll address his country on national television to discuss what he called an "inhuman attack."